Please see the product size before buying, thank you. Cabinet size: 22*11.8*32.3 inch(56*30*82cm). ★The standing storage cabinet is made by the HOMFA. The HOMFA concentrate on the quality, beauty and safe of the products. The most professional designers, the best producers and equipment, can ensure the customer get the best items. We always try our best to improve the quality and let the customers satisfied. ★The standing storage is created by the high quality MDF( Medium Density Fiber-board) wooden .It can use for bedroom, bathroom, kitchen and other occasions by the material and nice design . ✔TOP QUALITY MATERIAL: Made of High quality MDF( Medium Density Fiber-board) wooden. ✔BEAUTIFUL: The finish is pure white and design is newest,elegant and beautiful. ✔MULTIPURPOSE:You can choose it for bedroom, bathroom, kitchen and other occasions. 【SAFE AND BEAUTIFUL】Please see the product size before buying, thank you. Cabinet size: 22*11.8*32.3 inch(56*30*82cm). The floor cabinet is created by durable natural fiberboards for long-term use, environmentally friendly paint to secure no harm to your family. The finish is pure white and design is newest, elegant and beautiful. 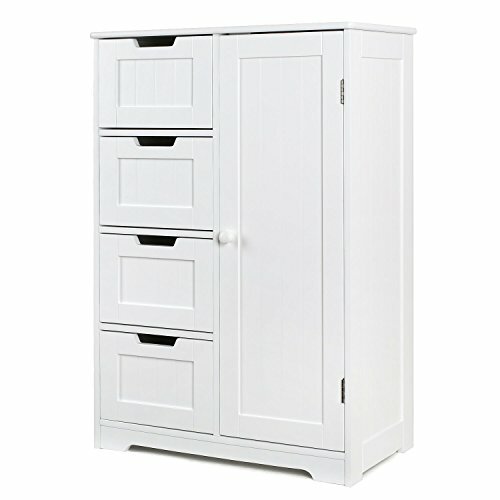 【MULTIPURPOSE】The floor cabinet storage with four drawers and a big cupboard.You can put in clothes, books in the drawers, bigger and higher things such as kitchen sets, wine in cupboard .You can choose it for bedroom, bathroom, kitchen and other occasions. 【CONVENIENT AND LARGE SPACE】The drawers and cupboard have a reasonable design, you can easy open and close them. The storage space is large. Also you could also place on the the top of this unit. 【WATERPROOF】The High-quality MDF( Medium Density Fiber-board) wooden material with stands the humidity of the bathroom and prevents moisture. 【EASY TO INSTALL】This cabinet unit is easy to assemble and all mounting hardware is included. You only do it though the instructions, cost about 30 minutes.